If you’re into Open Source software, 3D modeling or Do It Yourself audio, you may already know Wiebe under his on-line alias, Halfgaar. Personally, I’ve known him since I was 10 and he was 9. These days he’s still a very good friend, and even a colleague. 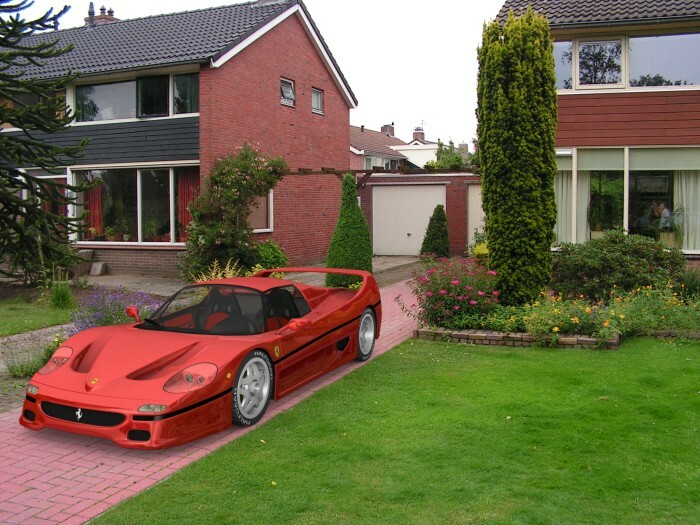 His Ferrari F50, not your usual lawn decoration. As a very analytical, factual thinker, Wiebe is the kind of person who doesn’t run with the newest buzzwords. He simply says what he thinks and his thoughts usually follow from very sound and steady logic. As a programmer, this makes him invaluable. At times, as a human, this may make him hard to stomach if, as is usual, he is right and you are not. But, don’t worry: he will usually be kind enough to explain to you exactly—very exactly—why it is that you are wrong. So, he may not be the type for marketing, but for anything that needs to be done robustly and thoroughly, he is irreplaceable. System administration: As every Geek with family and friends, Wiebe has the obligatory knowledge of how to keep a network of Windows systems somewhat stable, but this knowledge is irrelevant compared to his experience and skill in Unix system administration. His favourite Linux distribution is Gentoo Linux and, as follows from his many posts to the Gentoo Forums, he is a Linux Guru indeed. Backups: even to most system administrators, they’re just an afterthought, but he really knows his dar backups from your tar’s. And, he’s published about it too. Audio-engineering requires an enormous level of insight in the complex dynamics of audio waves and electronics. To me, it’s mostly Chinese, but he has built his own amps, speakers and subwoofer. If he notices even the slightest artifact in the sound, he goes back to the drawing board and just redoes the circuits another time. Wiebe can be contacted at wiebe@halfgaar.net, unless if you’re a spammer, because he happens to be an expert-level SpamAssassin administrator. www.halfgaar.net – the official website. His profile at the Gentoo Forums.